i am so much in love with my new chair. if i had a lappie there’d be no removing me from it ever. i’d have to be turned at regular intervals to prevent my skin from fusing with it. ewwwww. i found the chair on ebay (natch) it’s in near perfect nick except the tips of the arms are rather discoloured and cracked. 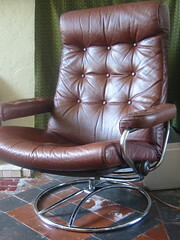 i think i paid a good price for a 70’s model (and a fraction of the current new price) mostly because it wasn’t listed as leather, let alone ekornes (although the name and patents are on the label). it’s obviously a high quality piece of furniture, and immensely comfy, swivels all the way round and you just lean back to recline it. we’ve yet to figure out how to twizzle the knobs to get it to stay put in a particular position - it stays just where you want it while you’re in it, but returns to upright as you sit up - but if it turns out we can’t it’s no biggie. most importantly there’s room for one and a half, so it’s the perfect story time chair, which is exactly what i wanted it for. well, that and swivelling round whilst stroking the cat on my knee, saying “so, mr bond…” in a cod eastern european accent, a fair amount of which has also been going on. on the same slightly o/t theme piccies of the newly done rooms are still pending. i took a few shots earlier but a) i need to get out of my usual “details” frame of mind (engendered by too many years living in a house that desperately needed plaster and paint, perhaps?) so you can actually see the overall effect and b) i need to get my tripod out cos there’s not quite enough light to get decent handheld shots. and finally, today i’ve had a throughly enjoyable time browsing the apartment therapy smallest coolest apartment contest for some extra pointers. although we’re blessed with rather more square footage than the 650 contest limit* and i’ve yet to see an entry that has to accommodate children full-time, i think there’s still a lot we could learn from here. i love our little house and dearly want to make it work for us as a family for as long as possible, so learning how to maximise the space and pull it all together visually is important to me. *edit: out of curiosity i searched out our original agent’s details, and it turns out we have around 600 square feet. it feels like so much more space than most of the apartments i’ve seen in the contest, perhaps it’s just a visual trick of viewing everything in photographs, or maybe because we have 7 rooms over 2 floors rather than one large space, i dunno. i am half tempted to enter next year’s contest though, if only to enjoy the snidey comments about my bland and derivative taste and oh god not more ikea :lol: but then i’d have to tidy up the whole house for the pictures, which aint ever going to happen.